Heat oven to 350°F. In 2-quart saucepan, heat water, butter and salt to boiling. Remove from heat. Stir in milk and dry potatoes just until moistened. Let stand about 30 seconds or until liquid is absorbed; whip with fork until fluffy. Stir in relish, mayonnaise, onion and mustard. Spread in ungreased 1-quart casserole. Cut each hot dog lengthwise in half, then crosswise in half. 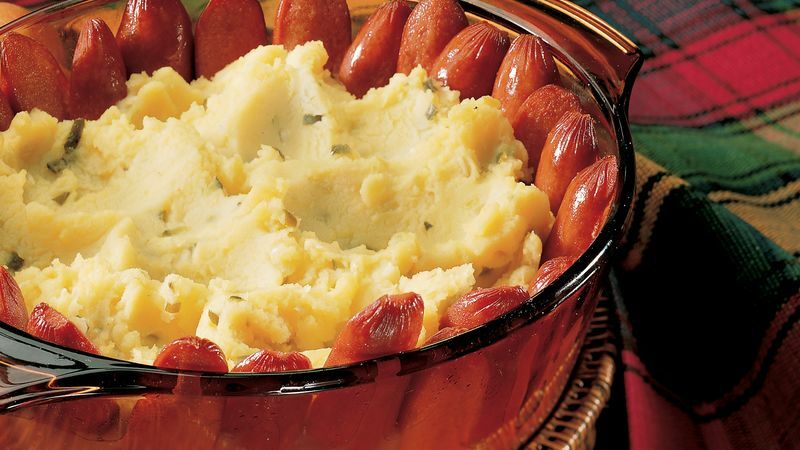 Arrange hot dog pieces around edge of mashed potatoes. Bake uncovered 25 to 30 minutes or until center is hot. For a complete meal, serve with cheese wedges, crunchy carrot sticks and apple slices. If you're in a super-big hurry, simply make mashed potatoes and stir in all ingredients, including hot dogs that have been cut into 1-inch pieces.